Once known as a “drug capital” and associated with kidnappings, violence, and excess, Bogotá, Colombia, has undergone a transformation that some have termed “the miracle of Bogotá.” Beginning in the late 1980s, the city emerged from a long period of political and social instability to become an unexpected model of urban development through the redesign and revitalization of the public realm—parks, transportation, and derelict spaces—under the leadership of two “public space mayors,” Antanas Mockus and Enrique Peñalosa (the latter reelected in 2015). 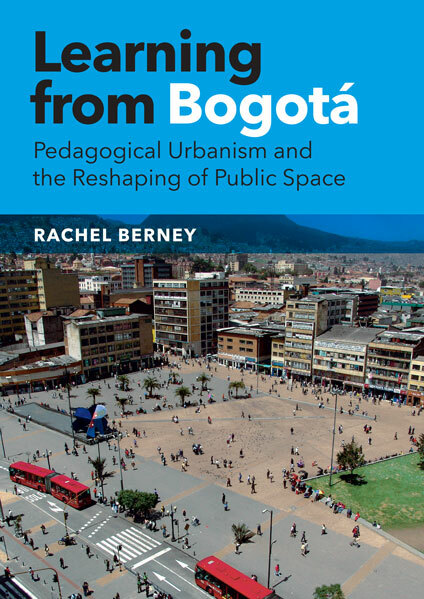 In Learning from Bogotá, Rachel Berney analyzes how these mayors worked to reconfigure the troubled city into a pedagogical one whose public spaces and urban policy have helped shape a more tolerant and aware citizenry. Berney examines the contributions of Mockus and Peñalosa through the lenses of both spatial/urban design and the city’s history. She shows how, through the careful intertwining of new public space and transportation projects, the reclamation of privatized public space, and the refurbishment of dilapidated open spaces, the mayors enacted an ambitious urban vision for Bogotá without resorting to the failed method of the top-down city master plan. Illuminating the complex interplay between formal politics, urban planning, and improvised social strategies, as well as the negative consequences that accompanied Bogotá’s metamorphosis, Learning from Bogotá offers significant lessons about the possibility for positive and lasting change in cities around the world. Berney is an assistant professor of urban design in the College of Built Environments at the University of Washington.